Missouri’s meth problem is no secret. 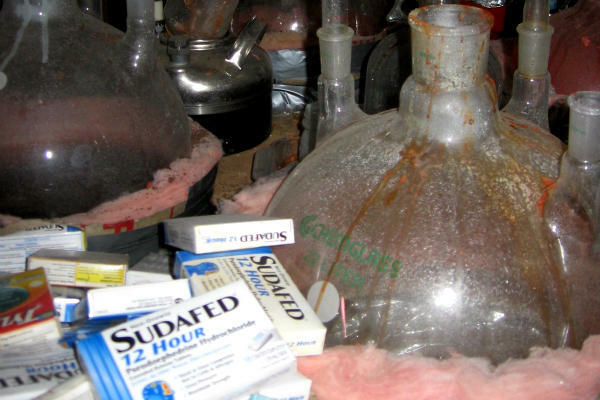 In 2012, the Show-Me State has the highest number of meth-lab seizure in the country. But beyond the busts — Missouri has no statewide regulation on what to do with former meth labs. On AMC’s ‘Breaking Bad,’ meth cooks prepare a batch in a trailer in the desert or a dirty and abandoned house. But this image of secrecy and seclusion isn’t always true. Timothy Sigmund is a real estate attorney from Jefferson City. He says many meth labs aren’t where pop culture might suggest they are. Jefferson County near St. Louis has the second most meth lab busts in the country in the past eight years. Officials seize almost 500 meth labs each year between 2004 and 2012, according to the Drug Enforcement Administration's National Register. There is an agreement that the high number of busted labs is the result of better regulations or police work, not just evidence of a bigger problem than in other places. But what happens to the almost hundreds of former meth labs that has been contaminated by meth-making chemicals? All current regulations regarding contaminated property are voluntary. No state or federal law regulates cleanup. Jefferson and St. Charles are the only two counties in Missouri that have introduced special regulations that call for a quarantine of the property after a seizure and before decontamination. Here’s how it usually works: Once police are done with a meth lab, the landowner gets a notice of violation. He or she has to decontaminate the property within 20 days. Decontamination can cost up to $100,000. Art Genasci is the director of Neighborhood Preservation of St Charles County. He says if no decontamination happens, sometimes officials can stop electric service to make sure the property is not used. Buyers who unknowingly bought a meth-contaminated house can take the case to court because landowners have to disclose the fact the property’s condemned status if they knew of it. But, “The burden is on the buyer or on the tenant to prove that [the property owner or the landlord] did know, or, the evidence shows that they had to know,” said Sigmund, the real estate attorney. And even if the landowner knew, there is no guarantee for compensation. There is no set penalty for not disclosing condemned status and it’s hard to prove the damages – it takes time for the chemicals to affect people’s health. State Rep. Jeff Roorda from Jefferson County says that the county regulations are not a good enough measure to apply to the entire state. “This patchwork approach, while it has moved us forward and has had a positive effect... All it really does is move meth labs around our state,” Roorda said. He agrees the leftover dangerous chemicals are a hazard and needs better regulation. Short-term health consequences of living in a meth house can include migraines, respiratory difficulties and skin irritation. A study published in 2010 in the peer-reviewed journal Toxicological Sciences suggested in the long run, exposure to the chemicals could cause cancer.